Publisher's Note: Man With a Movie Camera is part of a new five-cassette video series from Kino on Video, called "The Soviet Avant Garde." The score was recorded by the Alloy Orchestra using Vertov's precise instructions for musical and non-musical accompaniment. Dziga Vertov's Man With a Movie Camera (1929) is a stunning avant-garde, documentary meta-narrative which celebrates Soviet workers and filmmaking. The film uses radical editing techniques and cinematic pyrotechnics to portray a typical day in Moscow from dawn to dusk. But Vertov isn't just recording reality, he transforms it through the power of the camera's "kino-glaz" (cinema eye). Vertov's rich imagery transcends the earth-bound limitations of our everyday ways of seeing. Vertov was a working-class artist who desired to link workers with machines. His film opens with a manifesto, a series of intertitles telling us that this film is an "experiment," a search for an "absolute language of cinema" that is "based on its total separation from the language of literature and theater." This manifesto echoes an earlier one that Vertov wrote in 1922, in which he disavowed the films of D. W. Griffith and others as psychological dramas--cliches, copies of copies, films overly indebted to novels and theatrical conventions. Vertov desired to create cinema that had its own "rhythm, one lifted from nowhere else, and we find it in the movements of things." For Vertov an emphasis on the psychological interfered with the worker's "desire for kinship with the machine." And as a peoples' artist, Vertov felt that the peoples' cinema must "introduce creative joy into all mechanical labor" and "foster new people." And foster he does. The Man With a Movie Camera is divided into nine orchestral-type movements, and several of them use rapid-fire editing, wild juxtapositions (e.g. blinking eyes with shutter blinds) and multiple exposures to mesh workers with machines in a simultaneity of reverence and celebration. Levers and wheels turn and workers synchronously turn with them. 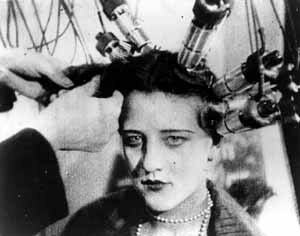 Later, Vertov reveals more mechanical reality as he juxtaposes a woman getting her hair washed with another washing clothes, and then shows a barber shaving a man, and sharpening a razor's edge. The sequence ends with newspapers rifling along a printing press, and a young woman packing cigarettes, watching the machine's quick slap pressing, while smiling at her labor. As Vertov revealed the joys of work, the rhythm of workers and machines, he also felt that filmmaking (as a largely technological medium) was also a component of that mechanical reality. In the aforementioned sequence of a cigarette worker and her machine, Vertov also splices into the mise-en-scene his wife and editor, Yelizavela Svilova. As shoes are shined and a woman gets her hair cut and fingernails polished, an edit reveals Svilova rubbing emulsion off the film strip, suggesting that polishing the beauty of cinema is synchronous with the peoples' visit to the beauty salon. More importantly, Svilova's appearance stitched into another montage (a woman sews, fabric linked with thread, while Svilova edits, film threaded through a splicer) strongly suggests that filmmaking is workmanlike, the perfect analog to the worker's life. imagery in the beauty salon. Besides celebrating workers, machines, and filmmaking as constituting Soviet reality, Vertov uses kino-eye to transcend the very reality he celebrates. In a 1923 manifesto, Vertov wrote "I am kino-eye, I am mechanical eye, I, a machine, show you the world as only I can see it." And he boldly asserted: "My path leads to the creation of a fresh perception of the world I decipher in a new way a world unknown to you." Again this ground-breaking film brings to fruition Vertov's earlier vision of what cinema should be. His camera, in the hands of brother Mikhail Kaufman, is never static; it travels where we can't--up smokestacks, under train tracks--and through continuous explosions of cinematic trickery--variable camera speeds, dissolves, split-screen effects, the use of prismatic lenses, and tightly structured montage--Vertov transforms not only reality, but traditional narrative cinema. He moves outside of Hollywood storytelling (three-act structures, goal-oriented characters), and closer to an absolute language of cinema that he seeks. The film's middle section captures some of the absolute language of the kino-eye. The sequence begins with a low-angle canted shot of a traffic light turning. Then from on high, the camera visible frame right, kino-eye overlooks a busy Moscow street. Cut to a joyous couple walking into a municipality, where they sign a wedding registration. Kino-eye then returns to the previous establishing shot, as the camera pans the street, and then cuts to the traffic signal reversing. This switch cues a shift in mood which is reinforced as next cut shows the camera, frame right, spinning around and portraying a darker side to life's dialectics. Kino-eye now shows a disconsolate couple entering the municipality to fill out a divorce registration. Their pending separation is foregrounded in kino-eye's shot selection: an occasional two-shot mixed with six separate shots of the woman, chin in her hands, and four separate shots of the man, looking weary and angry. Kino-eye follows this with a prismatic image of streetcars crossing in V-shaped diagonals and then offers more dialectics: a crosscut sequence of automobiles heading to a funeral and an agonized woman, awaiting the birth of her child. The sequence concludes with the cameraman superimposed over a prismatic street, buildings leaning at weirdly oblique angles, and in a graphic punctuation, a baby born from kino-eye's doctorly point-of-view. In three minutes, Vertov's kino-eye has ordered material reality in fresh, original ways, revealing a range of motion (high/low compositions and stunning taboo images of the baby's birth) and emotion (marriage/divorce; death/life). The film's conclusion is aesthetically beautiful and ideologically committed. Oddly, in the 1930s the Stalinists didn't think so. Vertov fell into disfavor with their regime and this film and others were accused of formalist error, of placing aesthetics ahead of ideological commitment. It's unfortunate that a man who wanted to link the cinematic machine with the people could be so mistrusted, because Man With a Movie Camera has a wonderfully rousing coda that links spectators within the theatrical diegesis to their onscreen counterparts (the film within the film). And as they watch their images everything coalesces: machines (typewriter keys, spinning wheels, mechanical spinners, streetcars) and people (walking the streets, driving cars, resting at the beach) in rhythm, and in kinship. But perhaps the cameraman riding above the sea of prismatically coalesced imagery bothered the Stalinists. Perhaps they saw in that cameraman not formalist error but a brilliant representation of the powerful kino-eye to not only see and know all then (1929), but to possibly further see and expose a darkening future threatened by totalitarianism. 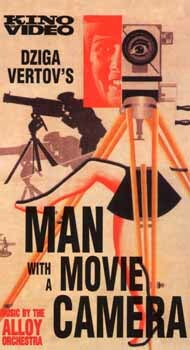 Man With a Movie Camera is part of a new five-cassette video series from Kino on Video, called "The Soviet Avant Garde." Other films in the series include Vsevolod Pudovkin's Storm Over Asia and Deserter, Victor Turin's Turksib, and Lev Kuleshov's By the Law. Suggested retail price: $29.95 each. For more information, we suggest you check out the Kino Web site: http://www.kino.com.